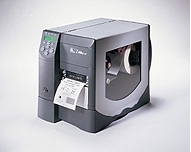 Processing labels fast is a breeze with the Z4Mplus and Z6Mplus industrial and commercial bar code printers. At 10 inches per second, these Zebra printers output labels quickly and efficiently, maximizing productivity. The Z4Mplus and Z6Mplus die-cast metal construction provides rugged reliability for the tough environments and demanding applications of manufacturing plants and distribution centers.